The Day-Lit growth chamber bridges the gap between electrically lit research chambers and field experiments done in actual sunlight conditions. It offers the reliable temperature control of our conventional growth chambers with the advantages of natural sunlight in a free standing outdoor unit. Originally designed by EGC for the US Department of Agriculture, the Day-Lit chamber has proved a popular addition to our line of controlled environment growth chambers. 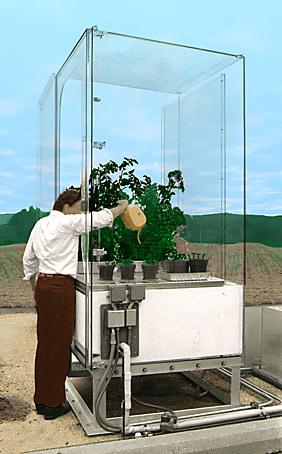 Sunlit plant growth chambers are also known as SPAR (Soil Plant Atmosphere Research Facility) chambers. SPAR chambers allow the study of crop development under natural light while providing precise control of plant aerial and root environments. Temperature control is provided by a remote refrigeration package typically mounted in a low weatherproof enclosure near the chamber. On multi-unit installations a centralized chiller system with secondary coils for each unit can be utilized for better operating economies. Our microprocessor controllers can be mounted individually, or networked together to provide centralized control and data collection. Interior dimensions 48" x 48" x 72"